The new Mahindra Thar will launch next year and if rumours are to be believed, the Italian car design firm Pininfarina might play a vital role in its development and design. We have known for some time now that Mahindra is currently in the process of developing the new Thar, and just recently there have been some spy shots of the vehicle that are currently being shared on the web. Still though, not much is known about the new Thar and Mahindra has been very tight-lipped about the new off-road vehicle. Mahindra have just launched two new vehicles this year in the form of the Alturas and the Marazzo. Both of these vehicles have been designed very nicely and are taking the company in a new direction. All of this has happened because of Mahindra's ownership of the legendary Italian car design company Pininfarina. The new vehicles from Mahindra look modern and fresh and it looks like Pininfarina is making a positive impact on the Indian carmaker. Because of this, we also suspect that the new Mahindra Thar will also be designed with the help of Pininfarina. If that is the case, then we can expect the new Thar to look like an international product, and the interiors might be vastly improved. From the spy shots we have seen, the car is heavily camouflaged, but we can see that the new Thar will be much wider and longer thanks to its new chassis. 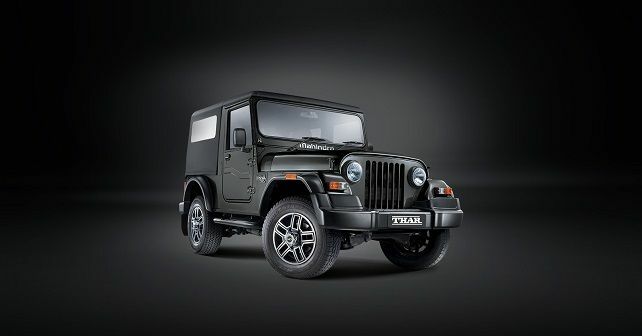 The new Thar will also most likely come fitted with the 2.2-litre mHawk engine, which will be tweaked for more refinement and become BS-VI compliant. It will still feature 4WD making it great for off-roading, but it will also get added creature comforts, a better quality dash with great features and some additional safety technology. As of now, very little is being said, but we can expect the car to be production ready by the end of 2019, and we look forward to seeing how Pininfarina, as well as Korean carmaker Ssangyong, will influence the design and development of India's favorite off-road vehicle.